When Natural Retreats - a company until then most identified with running a holiday rentals company - took over, it promised a transformation. Even working out who owned what wasn't simple. 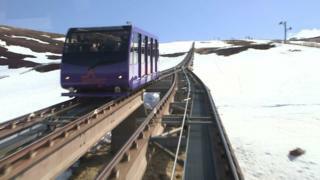 The infrastructure on the mountain - the lifts and railway - are in public hands. The operating company - along with assets like vehicles and movable infrastructure on the hill - were sold for just over £230,000. They discovered that the company had in fact been sold to Natural Assets Investments Limited (NAIL) - a company with many of the same directors as Natural Retreats. Natural Retreats had the lease to operate the mountain - but the assets had been transferred to the wider group. This isn't unusual or in any way wrong. But what people wanted to know was if Natural Retreats wasn't investing as originally planned, was it also taking money out? That's where the Administrator's Statement came in handy. That's more than the management fees that were signed off by HIE as part of the asset transfer. We asked HIE and they said they didn't know - but were still trying to find out. We put them all to the company - which seems to have rebadged itself as Travel Together in the past two weeks. There was other information in the administrator's statement that raises questions about the relationship between HIE and Natural Retreats. It paid over £440,000. That's almost twice the original price paid by NAIL. The agency was clear - it's role was to protect the future viability of the mountain. Over the last week or so we've seen winter return to our mountains with a vengeance. Nevertheless, it's still not at all clear that the past four years represent anything other than a wasted opportunity for a business dependent on public money and crucial to the future of a community that desperately needs it to succeed.